Khenchen Pema Sherab (Tib. པདྨ་ཤེས་རབ་, Wyl. pad+ma shes rab) is one of the seniormost khenpos in the Nyingma tradition and one of the three Khenchen or 'great khenpos' of Namdroling Monastery. Khenpo Pema Sherab was born in 1936, at Riphu, in the Dergé region of Eastern Tibet. He started to study at the age of eight, learning to read and write Tibetan with his uncle, Lama Chözang, while he was herding cattle. At fourteen, he went to Lhasa and studied under masters and scholars of all schools of Tibetan Buddhism. In 1953 he received ordination from Shechen Kongtrul Rinpoche. In Lhasa, he also met Kyabjé Dilgo Khyentse Rinpoche and served as his attendant for about ten years, fleeing with him to Bhutan and then India in 1959. Over the years, he received many teachings from him, including the Guhyagarbha Tantra, and Longchenpa’s Treasury of Pith Instructions. During the 1950s he also stayed for long periods at Nenang Monastery and Tshurphu, the monastery of the Karmapas, which at that time was home to many great Kagyü masters who had escaped from the troubles in East Tibet. While on pilgrimage in Central Tibet, he met Jamyang Khyentse Chökyi Lodrö at Tsering Jong, the seat of Jikmé Lingpa. While in India, he also studied with Kyabjé Dudjom Rinpoche and Khenpo Tsöndrü. In 1968, at the request of Kyabjé Penor Rinpoche he went to Namdroling Monastery to teach. 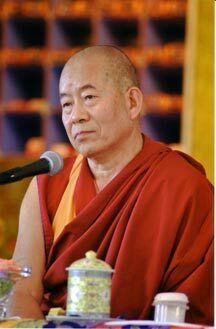 Though the shedra was not yet established at that time, Khen Rinpoche taught the monks for several years. The shedra was finally established in 1978 and from then until 2003, for 25 years, Khenpo Pema Sherab taught there tirelessly while also managing the institution. Among the many books he has written are a biography of Guru Padmasambhava, an exposition of the two truths, lorik and tarik, and an exposition of logic. Dilgo Khyentse Rinpoche, Brilliant Moon, Shambhala, 2008, Chapter 15. Fleeing over the Mountains by Khenpo Pema Sherab. Rigpa Shedra, 27th December 2008, see internal links below. Lerab Ling, Thirty Pieces of Advice from the Heart, 23-24 August 2009, available for download here. Rigpa Shedra West 2010, Beacon of Certainty, Teachings on the first, second and third of the seven questions. Lerab Ling, 26 May-5 June 2010. Lerab Ling Monastic Community, A Concise Explanation of the Trainings of a Novice Monk which is Easy for Beginners to Understand, Khenpo Tsöndrü, 26 May-5 June 2010. Rigpa Shedra West 2011, Beacon of Certainty, Teachings on the fourth, fifth, and sixth of the seven questions. Lerab Ling, 23 May to 2 June, 2011. Rigpa Shedra West 2012, Beacon of Certainty, Teachings on the seventh question. Lerab Ling, September 2012. Lerab Ling, September 2012: the first two chapters of the Yönten Dzö. Teachings on Longchenpa's Advice from the Heart. Lerab Ling, August 2009. This page was last edited on 19 September 2018, at 18:09.